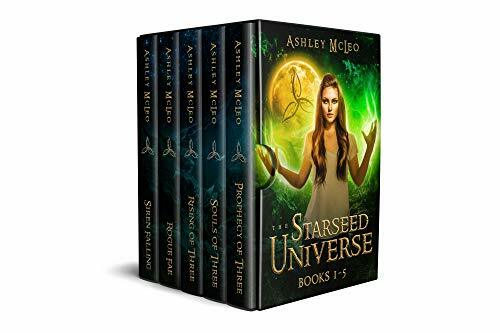 Today, I have Ashley McLeo here with me, chatting about her 5 book series, full of Celtic magic, The Starseed Universe! I’ve browsed McLeo’s books, and wow, the covers and book descriptions sound like something I’d read! FISCHER: Why Celtic Magic? What draws you to it as a writer? MCLEO: So many things! Probably the most obvious is that I’m Irish by descent, and a magic lover by nature. I pretty much stuck to Irish Celtic culture in this series, rather than Celts as a whole, which I can’t pretend to know too much about. Exploring a bit of my own heritage and dreaming that my ancestors could have been Irish magic workers was a real draw. I’m a sucker for imagining women brewing potions and working magic in a sweet little cottage in the woods. Hence, Fern Cottage was born! I took elements of Celtic lore and history like the Morrigan, herbalism, and actual witches from the past and wove them into a narrative that was thoroughly modern day. I even added a touch of sci-fi with the concepts of portals, starseeds, and magical aliens. Clashing the ancient with the new and seeing how it plays out is one of my absolute favorite things to do in writing. I love both fantasy and sci-fi. To be able to incorporate them in the same series was a lot of fun. To be honest, I originally planned on adding a lot more of an Irish Faerie aspect to this series, but that didn’t work out. Instead, I’ve saved that for an upcoming project, I’m working on titled: The Bonegates Series, which is heavily steeped in Faerie lore (from many cultures). Lastly, it didn’t hurt that I was able to take a trip to Ireland close to the publication of book two, Souls of Three. That trip was amazing, and helped inspire me to finish Rising of Three, the final book in the trilogy, with an authentic Celtic bang! FISCHER: What makes your series unique compared to the other celtic mythology books on the market? I bound the concept of ancient magic and the souls of witchy saviors to aliens trying to take over Earth. Also, my series is very much about family over any other type of relationship. Yes, romances and friendships are there too, and I adore all of them, but the meat of the book is about family. Primarily, the female relationships in the McKay witching clan are the focus. I feel like saying any more than that would be spoilers, but honestly, I don’t think I’ve read something quite like The Starseed Trilogy before. FISCHER: If you could choose one line from the series that best describes your books as a whole, which would you choose? MCLEO: This is SO hard! I don’t want to spoil anything, but I DO want to entice! Here’s a line from Souls of Three, said by Mary McKay a bookish bombshell. 🙂 It’s kind of the essence of the trilogy. Magic. Celtic mythology like you’ve never seen before. And a battle to save us all. Their opponents? The fata—otherworldly magical beings whose abilities far surpass any supernatural on earth. That is until the sisters can master their magic. With their magic restored, the sisters must fulfill an ancient prophecy lost during the fire of the Library of Alexandria. If they don’t all of humanity will be enslaved. But when one rises the other falls, and occult academic Sara is forced to face her demons. Accompanying novellas Rogue Fae and Siren Falling follow the adventures of fan-favorite secondary characters Gwenn, Rena, Emily, and Selma as they discover their powers, find each other, and learn who they really are. Full of action, romance, mythology, engaging characters you want to know, and sisterhood, The Starseed Universe is sure to keep you up all night!